Royal Mail is a company delivering letters and parcels in the UK and abroad. Did you know that Royal Mail was originally established in 1516? It was a public service until 2013 when the majority of its shares were floated on the London Stock Exchange. Royal Mail proposes a wide range of services: Universal Service, Special Delivery, Business Services, International Services. - 2nd class "Standard delivery"
- 2nd class "Signed For delivery"
- 1st class "Standard delivery"
- 1st class "Signed For delivery"
Sometimes, Retrofanattic uses the Signed For service, but customers only pay for the Standard Delivery service. I am constantly improving the choice of services for my customers. "Special Delivery by 1pm" has been added on the online shop, and it will soon be added on the eBay shop. Royal Mail increases their prices twice a year, usually in March and October. This does not mean that their tariffs increase all the time. Sometimes they actually decrease! In consequence, Retrofanattic usually revises its postage prices twice a year. International customers can choose to have a tracking number, thanks to the "Tracked and Signed" option at checkout. It is the equivalent of the domestic "Signed For" service. 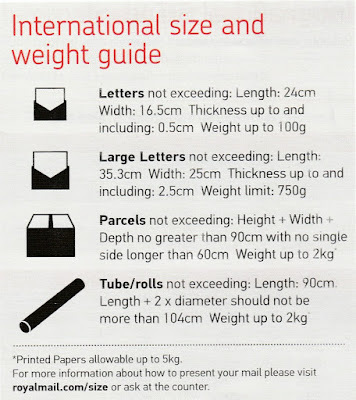 When using Royal Mail, the price of the postage is determined by the combination of the size and the weight of the item (= letter or parcel). - Royal Mail does not send large parcels. The more protection you use around an object, the bigger the parcel will be. 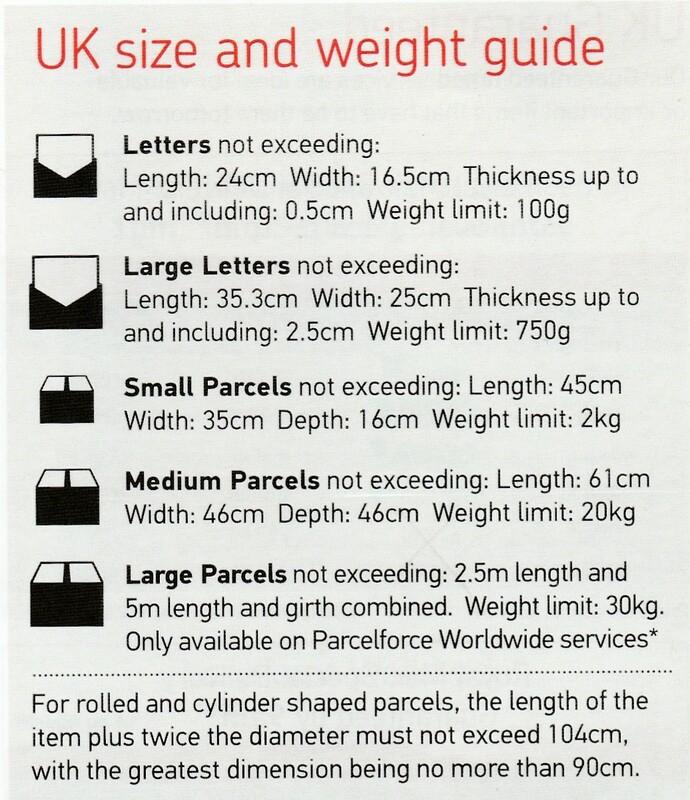 The maximum depth of a small parcel sent in the UK is 16 cm. Sometimes, 16 cm is not enough to allow a full protection of the item with bubble wrap and polystyrene peanuts. This is why, unless the object is very small, Retrofanattic always sends fragile items (glass or ceramic items) is medium to large parcels, and not in small parcels. This increases a little bit the price of the postage, but guarantees you that your object will arrive undamaged. 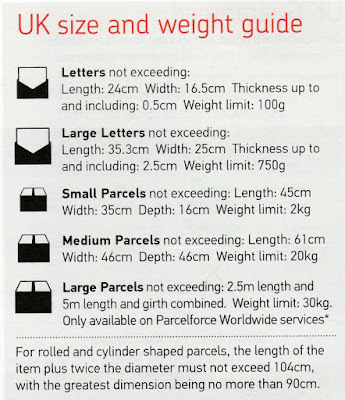 The maximum weight allowed when posting with Royal Mail small parcels is 2 kg. 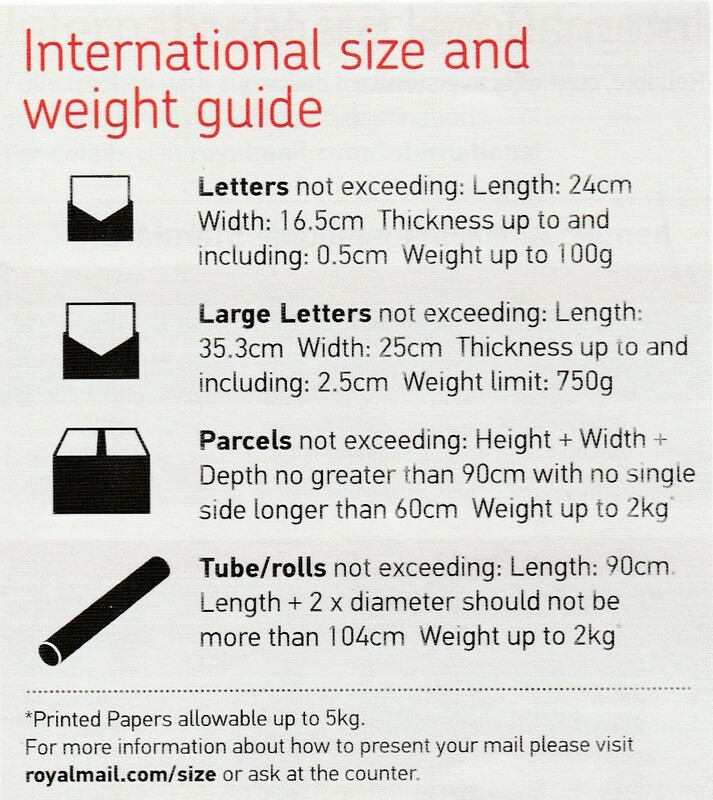 This is why heavier parcels will have to be sent "medium", even if the object is small. This is only theoretical as usually small items are not very heavy, and so far I never had to post a small object at the price of a medium parcel. Anyway, it is more interesting to post parcels that weigh more than 2 kg with another courier than Royal Mail: the price is the same or cheaper with another courier (example My Hermes) and you benefit from a fully tracked service. For domestic postage, Royal Mail does not offer a "fully tracked service" when you send your parcel Signed For. This means that you will only have two informations: when and where the parcel was dispatched, and when it arrived (+ signature). A fully tracked service scans your parcel at every stage of its journey, so you know exactly where it is and when it should arrive to your door. You can have a fully tracked service for domestic parcels if you choose Special Delivery at checkout, but the service is more expensive. However, Special Delivery is ideal when you want a present to arrive on time, if you have sent your Christmas parcels a bit late for example. The option "International Signed" does not offer a fully tracked service, but covers more destinations than the previous two. This option is not used by Retrofanattic at the moment. Any questions? Please feel free to contact me. I am here to help!